All Wars Are Bankers Wars – MUST SEE! Now presenting one of the greatest essays ever assembled about the true purpose of War over the last 250 years. Written by Michael Rivero, this film will truly change your views on how our banking system uses War to affect our daily lives. Recommended for all ages. 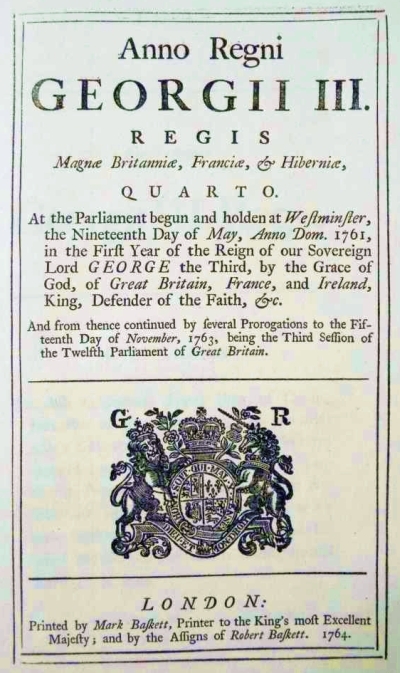 The United States fought the American Revolution primarily over King George III’s Currency act, which forced the colonists to conduct their business only using printed bank notes borrowed from the Bank of England at interest. After the revolution, the new United States adopted a radically different economic system in which the government issued its own value-based money, so that private banks like the Bank of England were not siphoning off the wealth of the people through interest-bearing bank notes. But bankers are nothing if not dedicated to their schemes to acquire your wealth, and know full well how easy it is to corrupt a nation’s leaders. 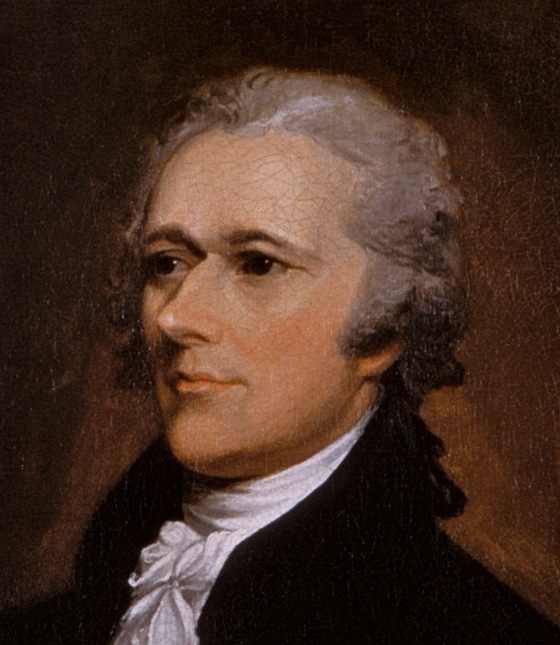 Just one year after Mayer Amschel Rothschild had uttered his infamous “Let me issue and control a nation’s money and I care not who makes the laws”, the bankers succeeded in setting up a new Private Central Bank called the First Bank of the United States, largely through the efforts of the Rothschild’s chief US supporter, Alexander Hamilton. Read “War Is A Racket” by Smedley Butler in the 1930s. ALL WARS ARE BANKERS’ WARS! I know many people have a great deal of difficulty comprehending just how many wars are started for no other purpose than to force private central banks onto nations, so let me share a few examples, so that you understand why the US Government is mired in so many wars against so many foreign nations. There is ample precedent for this. Following the revolution, the US Government actually took steps to keep the bankers out of the new government! Mayer Amschal RothschildJust one year after Mayer Amschel Rothschild had uttered his infamous “Let me issue and control a nation’s money and I care not who makes the laws”, the bankers succeeded in setting up a new Private Central Bank called the First Bank of the United States, largely through the efforts of the Rothschild’s chief US supporter, Alexander Hamilton. 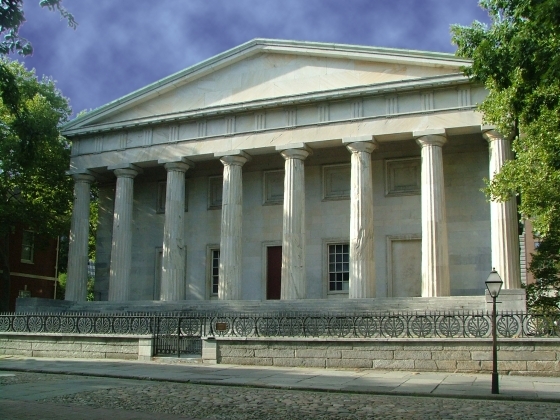 The First Bank of the United States – Click for larger imageFounded in 1791, by the end of its twenty year charter the First Bank of the United States had almost ruined the nation’s economy, while enriching the bankers. Congress refused to renew the charter and signaled their intention to go back to a state issued value based currency on which the people paid no interest at all to any banker. This resulted in a threat from Nathan Mayer Rothschild against the US Government, “Either the application for renewal of the charter is granted, or the United States will find itself involved in a most disastrous war.” Congress still refused to renew the charter for the First Bank of the United States, whereupon Nathan Mayer Rothschild railed, “Teach those impudent Americans a lesson! 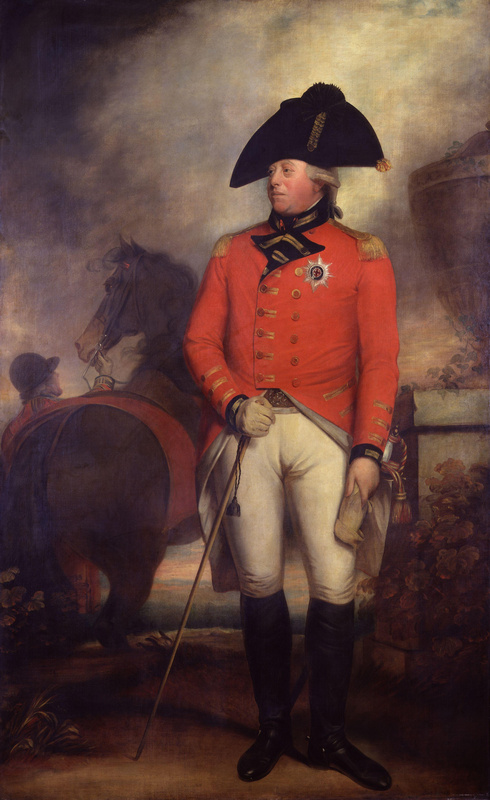 Bring them back to colonial status!” The British Prime Minister at the time, Spencer Perceval was adamently opposed to war with the United States, primarily because the majority of England’s military might was occupied with the ongoing Napoleonic wars. Spencer Perceval was concerned that Britain might not prevail in a new American war, a concern shared by many in the British government. Then, Spencer Perceval was assassinated (the only British Prime Minister to be assassinated in office) and replaced by Robert Banks Jenkinson, the 2nd Earl of Liverpool, who was fully supportive of a war to recapture the colonies. 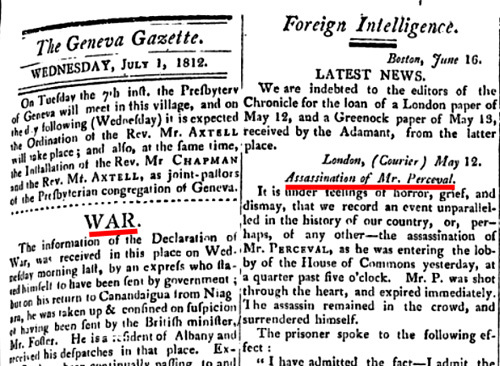 Click for larger image of the Geneva Gazette for July 1, 1812, reporting on the assassination of Spencer Perceval together with the declaration of the War of 1812. 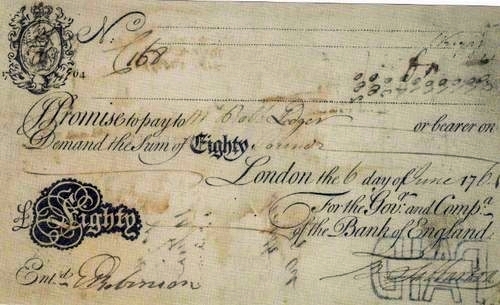 Financed at virtually no interest by the Rothschild controlled Bank of England, Britain then provoked the war of 1812 to recolonize the United States and force them back into the slavery of the Bank of England, or to plunge the United States into so much debt they would be forced to accept a new private central bank. And the plan worked. Even though the War of 1812 was won by the United States, Congress was forced to grant a new charter for yet another private bank issuing the public currency as loans at interest, the Second Bank of the United States. Once again, private bankers were in control of the nation’s money supply and cared not who made the laws or how many British and American soldiers had to die for it. 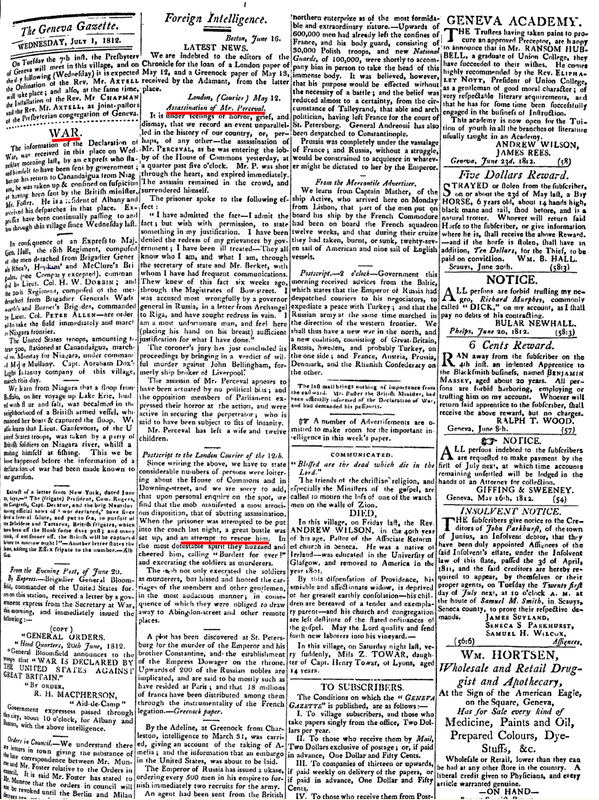 Once again the nation was plunged into debt, unemployment, and poverty by the predations of the private central bank, and in 1832 Andrew Jackson successfully campaigned for his second term as President under the slogan, “Jackson And No Bank!” True to his word, Jackson succeeds in blocking the renewal of the charter for the Second Bank of the United States. 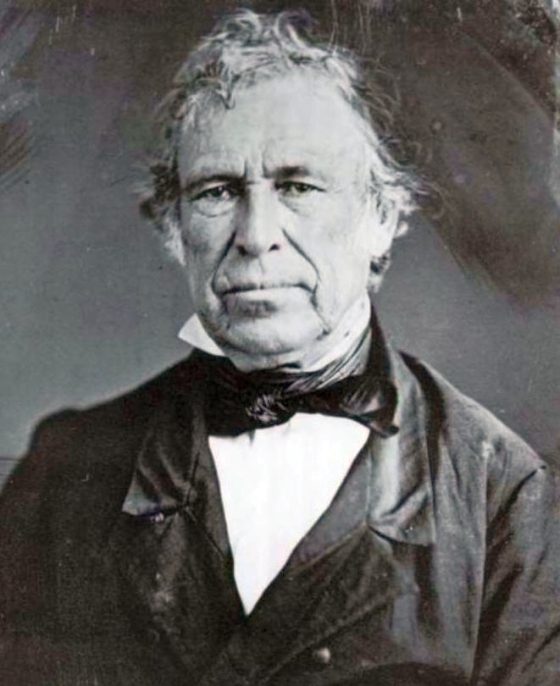 President Zachary Taylor opposed the creation of a new Private Central Bank, owing to the historical abuses of the First and Second Banks of the United States. Taylor died on July 9, 1850 after eating a bowl of cherries and milk rumored to have been poisoned. The symptoms he displayed are consistent with acute arsenic poisoning. 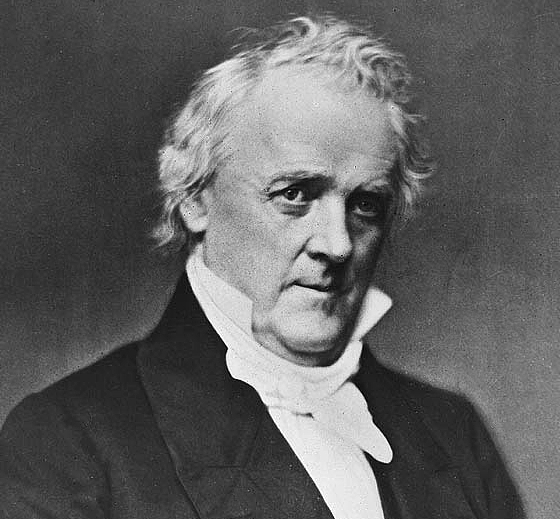 President James Buchanan also opposed a private central bank. 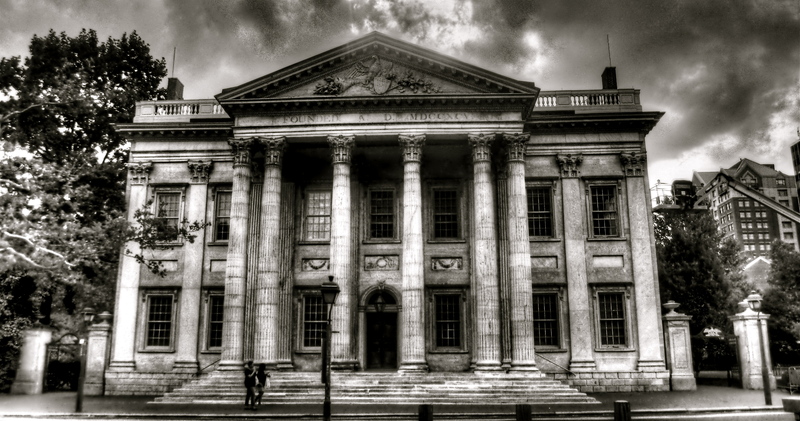 During the panic of 1857 he attempted to set limits on banks issuing more loans than they had actual funds, and to require all issued bank notes to be backed by Federal Government assets. 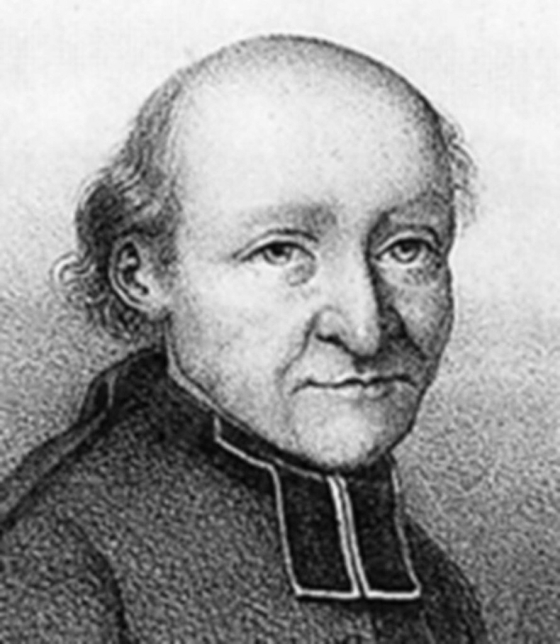 He was poisoned with arsenic and survived, although 38 other people at the dinner died. President James BuchanonThe public school system is as subservient to the bankers’ wishes to keep certain history from you, just as the corporate media is subservient to Monsanto’s wishes to keep the dangers of GMOs from you, and the global warming cult’s wishes to conceal from you that the Earth has actually been cooling for the last 16 years. Thus is should come as little surprise that much of the real reasons for the events of the Civil War are not well known to the average American. 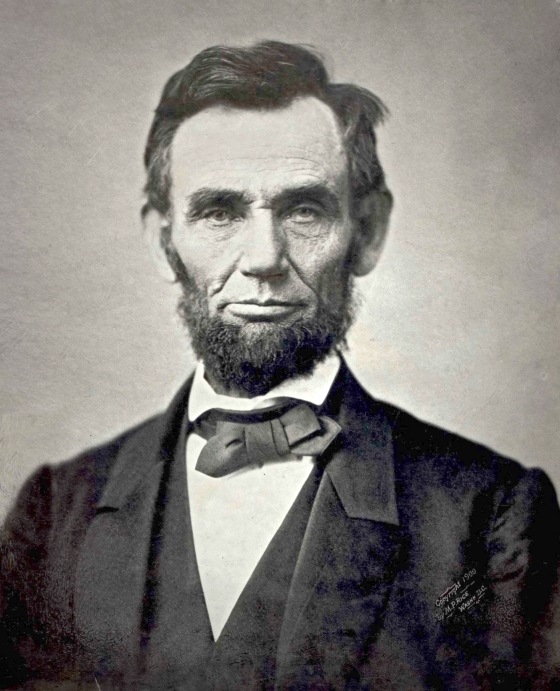 President Abraham LincolnWhen the Confederacy seceded from the United States, the bankers once again saw the opportunity for a rich harvest of debt, and offered to fund Lincoln’s efforts to bring the south back into the union, but at 30% interest. Lincoln remarked that he would not free the black man by enslaving the white man to the bankers and using his authority as President, issued a new government currency, the greenback. This was a direct threat to the wealth and power of the central bankers, who quickly responded. “If this mischievous financial policy, which has its origin in North America, shall become endurated down to a fixture, then that Government will furnish its own money without cost. It will pay off debts and be without debt. It will have all the money necessary to carry on its commerce. It will become prosperous without precedent in the history of the world. The brains, and wealth of all countries will go to North America. That country must be destroyed or it will destroy every monarchy on the globe.” — The London Times responding to Lincoln’s decision to issue government Greenbacks to finance the Civil War, rather than agree to private banker’s loans at 30% interest. 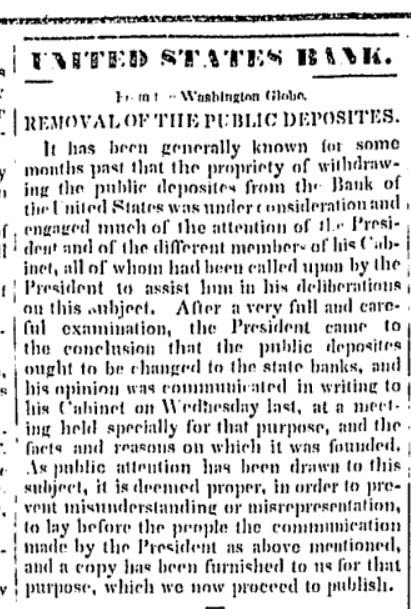 In 1872 New York bankers sent a letter to every bank in the United States, urging them to fund newspapers that opposed government-issued money (Lincoln’s greenbacks). Goaded by the private bankers, much of Europe supported the Confederacy against the Union, with the expectation that victory over Lincoln would mean the end of the Greenback. France and Britain considered an outright attack on the United States to aid the confederacy, but were held at bay by Russia, which had just ended the serfdom system and had a state central bank similar to the system the United States had been founded on. Tsar Alexander II of Russia, who prevented France and Britain from invading the US during the civil war.Left free of European intervention, the Union won the war, and Lincoln announced his intention to go on issuing greenbacks. Following Lincoln’s assassination, the Greenbacks were pulled from circulation and the American people forced to go back to an economy based on bank notes borrowed at interest from the private bankers. 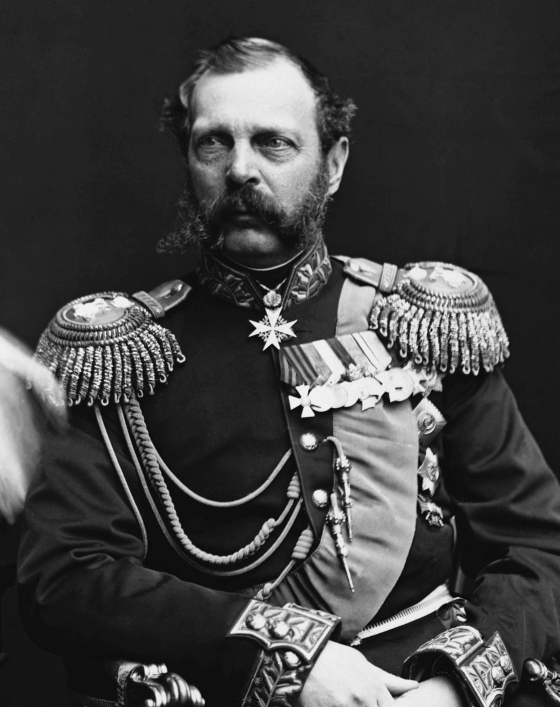 Tsar Alexander II, who authorized Russian military assistance to Lincoln, was subsequently the victim of multiple attempts on his life in 1866, 1879, and 1880, until his assassination in 1881. With the end of Lincoln’s Greenbacks, the US could no longer create its own interest free money and was manipulated during the term of President Ruthford B. Hayes into borrowing from the Rothschilds banking system in 1878, restoring to the Rothschilds control of the US economy they had lost under Andrew Jackson. Messrs. Rothschild & Sons to Mr. Sherman. Very pleased we have entered into relations again with American Government. Shall do our best to make the business successful. 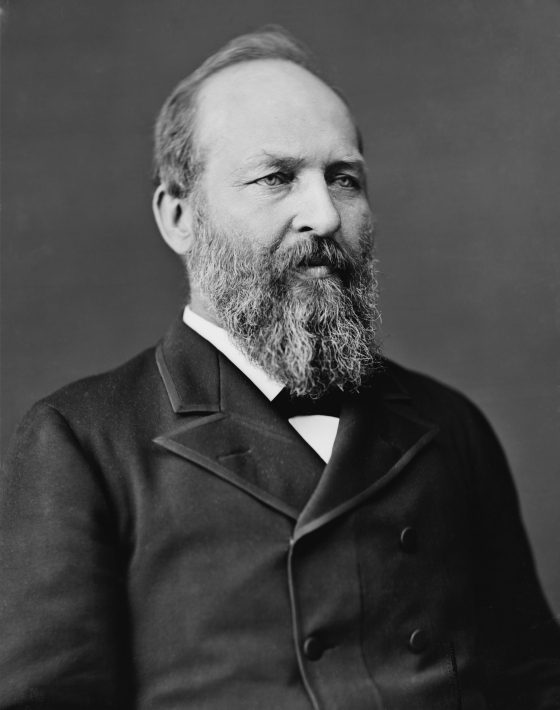 James A. Garfield was elected President in 1880 on a platform of government control of the money supply. President James GarfieldGarfield was shot on July 2, 1881 and died of his wounds several weeks later. Chester A. Arthur succeeded Garfield as President. 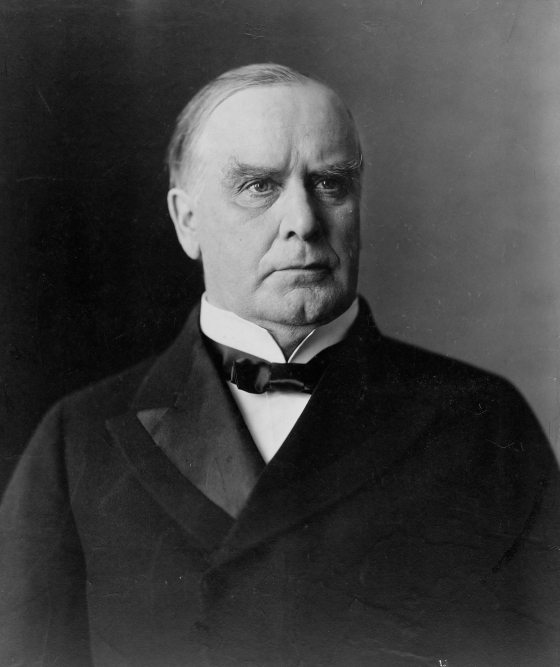 In 1896, William McKinley was elected President in the middle of a depression-driven debate over gold-backed government currency versus bank notes borrowed at interest from private banks. McKinley favored gold-backed currencies and a balanced government budget which would free the public from accumulating debt. President William McKinleyMcKinley was shot by an out-of-work anarchist on September 14, 1901, in Buffalo, NY, succumbing to his wounds a few days later. He was suceeded in office by Theodore Roosevelt. 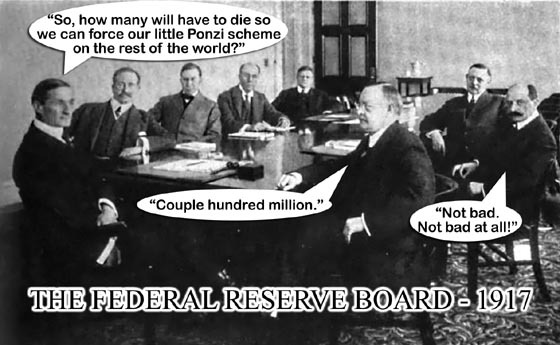 Finally, in 1913, the Private Central Bankers of Europe, in particular the Rothschilds of Great Britain and the Warburgs of Germany, met with their American financial collaborators on Jekyll Island, Georgia to form a new banking cartel with the express purpose of forming the Third Bank of the United States, with the aim of placing complete control of the United States money supply once again under the control of private bankers. 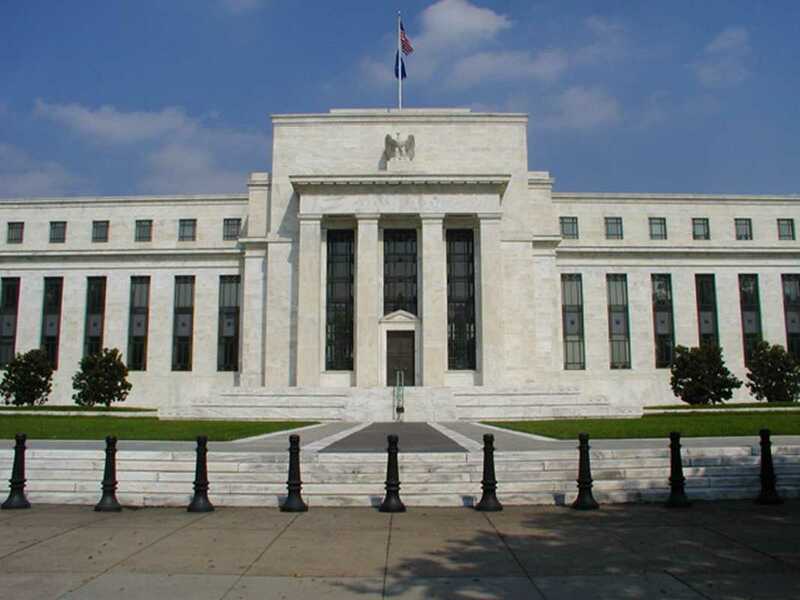 Owing to hostility over the previous banks, the name was changed to “The Federal Reserve” system in order to grant the new bank a quasi-governmental image, but in fact it is a privately owned bank, no more “Federal” than Federal Express. The Federal Reserve; it is neither “Federal” nor does it have any actual “Reserves”, creating as it does money out of thin air. 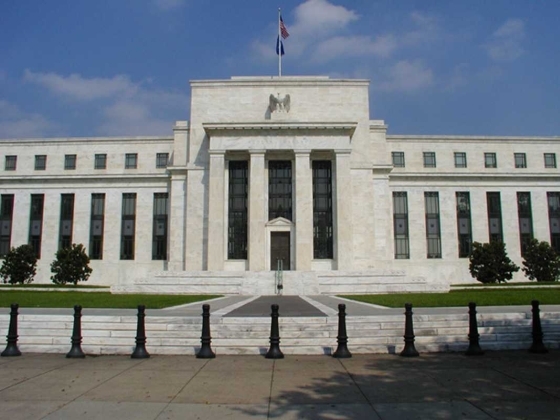 – Click for larger imageIn 2012, the Federal Reserve attempted to rebuff a Freedom of Information Lawsuit by Bloomberg News on the grounds that as a private banking corporation and not actually a part of the government, the Freedom of Information Act did not apply to the “trade secret” operations of the Federal Reserve. 1913 proved to be a transformative year for the nation’s economy, first with the passage of the 16th “income tax” Amendment and the false claim that it had been ratified. “I think if you were to go back and and try to find and review the ratification of the 16th amendment, which was the internal revenue, the income tax, I think if you went back and examined that carefully, you would find that a sufficient number of states never ratified that amendment.” – U.S. District Court Judge James C. Fox, Sullivan Vs. United States, 2003. Later that same year, and apparently unwilling to risk another questionable amendment, Congress passed the Federal Reserve Act over Christmas holiday 1913, while members of Congress opposed to the measure were at home. This was a very underhanded deal, as the Constitution explicitly vests Congress with the authority to issue the public currency, does not authorize its delegation, and thus should have required a new Amendment to transfer that authority to a private bank. But pass it Congress did, and President Woodrow Wilson signed it as he promised the bankers he would in exchange for generous campaign contributions. 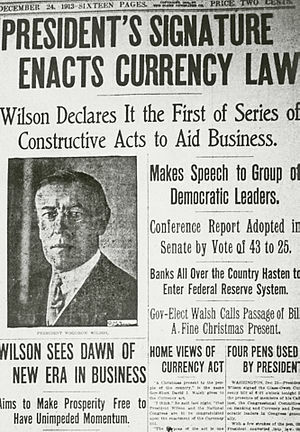 News report of Wilson’s signing the Federal Reserve Act. Under the Constitution, only a new Amendment could transfer the government’s authority to create the currency to a private party. Woodrow Wilson later regretted that decision. 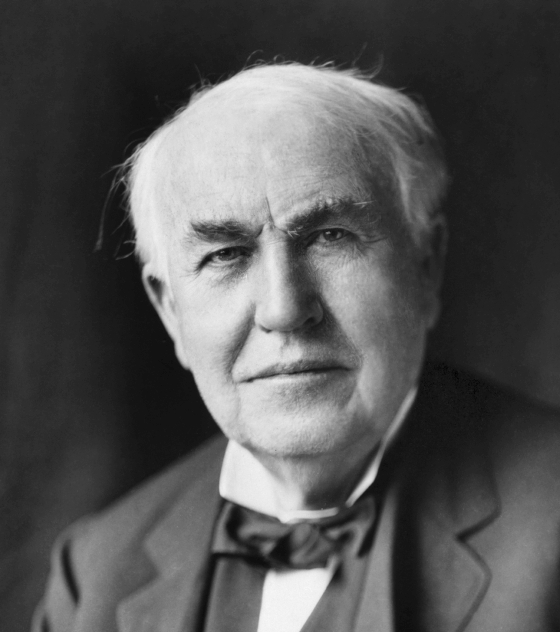 Thomas Edison, arguably the most brilliant man of the age, was also well aware of the fraud of private central banks. The next year, World War One started, and it is important to remember that prior to the creation of the Federal Reserve, there was no such thing as a world war. 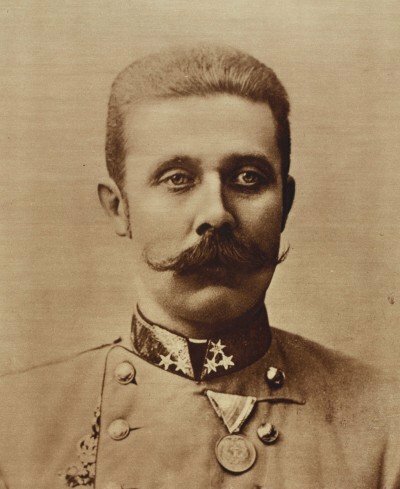 Click for larger imageWorld War One started between Austria-Hungary and Serbia with the assassination of Archduke Ferdinand. Archduke Franz Ferdinand, whose assassination triggered World War OneAlthough the war started between Austria-Hungary and Serbia , it quickly shifted to focus on Germany, whose industrial capacity was seen as an economic threat to Great Britain, who saw the decline of the British Pound as a result of too much emphasis on financial activity to the neglect of agriculture, industrial development, and infrastructure (not unlike the present day United States). Although pre-war Germany had a private central bank, it was heavily restricted and inflation kept to reasonable levels. Under government control, investment was guaranteed to internal economic development, and Germany was seen as a major power. 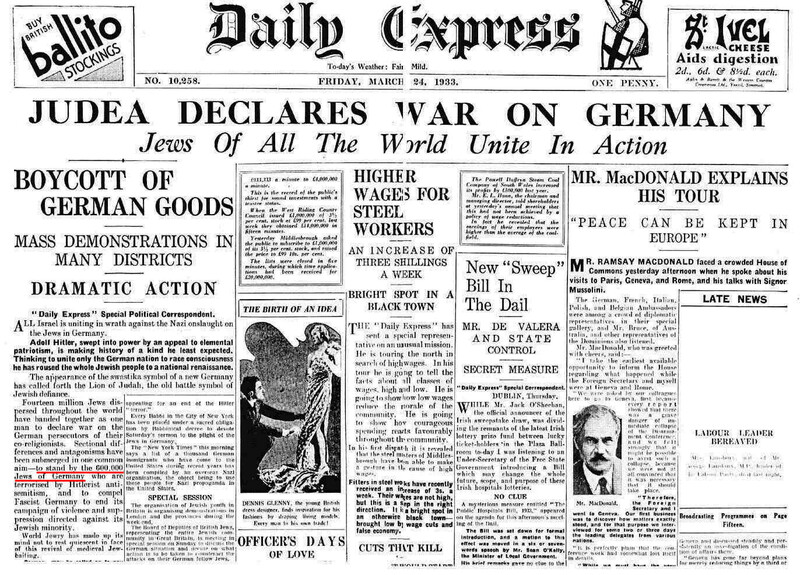 So, in the media of the day, Germany was portrayed as the prime opponent of World War One, and not just defeated, but its industrial base flattened. Following the Treaty of Versailles, Germany was ordered to pay the war costs of all the participating nations, even though Germany had not actually started the war. This amounted to three times the value of all of Germany itself. Germany’s private central bank, to whom Germany had gone deeply into debt to pay the costs of the war, broke free of government control, and massive inflation followed (mostly triggered by currency speculators) , permanently trapping the German people in endless debt. When the Weimar Republic collapsed economically, it opened the door for the National Socialists to take power. Their first financial move was to issue their own state currency which was not borrowed from private central bankers. Freed from having to pay interest on the money in circulation, Germany blossomed and quickly began to rebuild its industry. The media called it “The German Miracle”. TIME magazine lionized Hitler for the amazing improvement in life for the German people and the explosion of German industry, and even named him TIME Magazine’s Man Of The Year in 1938. 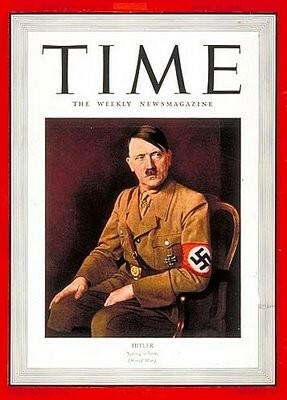 Hitler as TIME’s Man Of The YearOnce again, Germany’s industrial output became a threat to Great Britain. Germany’s state-issued value based currency was also a direct threat to the wealth and power of the private central banks, and as early as 1933 they started to organize a global boycott against Germany to strangle this upstart ruler who thought he could break free of private central bankers! 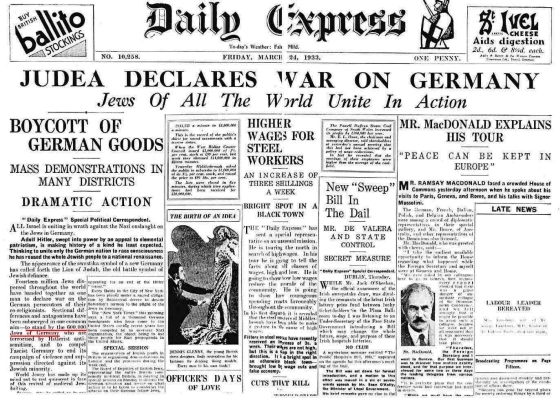 Click for larger imageAs had been the case in World War One, Great Britain and other nations threatened by Germany’s economic power looked for an excuse to go to war, and as public anger in Germany grew over the boycott, Hitler foolishly gave them that excuse. Years later, in a spirit of candor, the real reasons for that war were made clear. Marine Corps Major General Smedly Butler. 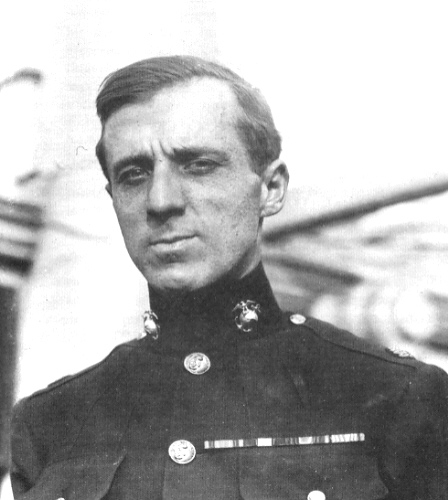 As a side note, we need to step back before WW2 and recall Marine Major General Smedley Butler. In 1933, Wall Street bankers and financiers had bankrolled the successful coups by both Hitler and Mussolini. Brown Brothers Harriman in New York was financing Hitler right up to the day war was declared with Germany. And they decided that a fascist dictatorship in the United States based on the one on Italy would be far better for their business interests than Roosevelt’s “New Deal” which threatened massive wealth re-distribution to recapitalize the working and middle class of America. So the Wall Street tycoons recruited General Butler to lead the overthrow of the US Government and install a “Secretary of General Affairs” who would be answerable to Wall Street and not the people, would crush social unrest and shut down all labor unions. General Butler pretended to go along with the scheme but then exposed the plot to Congress. Congress, then as now in the pocket of the Wall Street bankers, refused to act. When Roosevelt learned of the planned coup he demanded the arrest of the plotters, but the plotters simply reminded Roosevelt that if any one of them were sent to prison, their friends on Wall Street would deliberatly collapse the still-fragile economy and blame Roosevelt for it. Roosevelt was thus unable to act until the start of WW2, at which time he prosecuted many of the plotters under the Trading With The Enemy act. The Congressional minutes into the coup were finally declassified in 1967, but rumors of the attempted coup became the inspiration for the movie, “Seven Days in May” but with the true financial villains erased from the script. 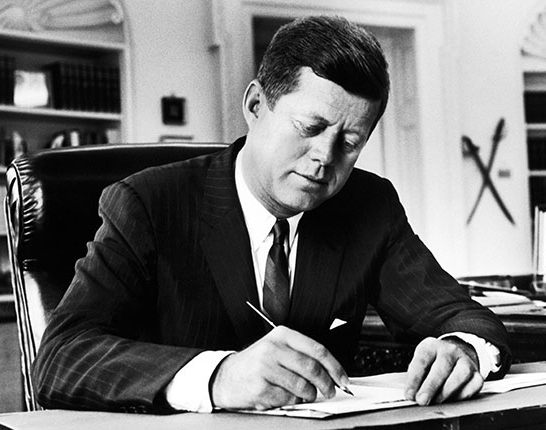 President John F. KennedyAs President, John F. Kennedy understood the predatory nature of private central banking. 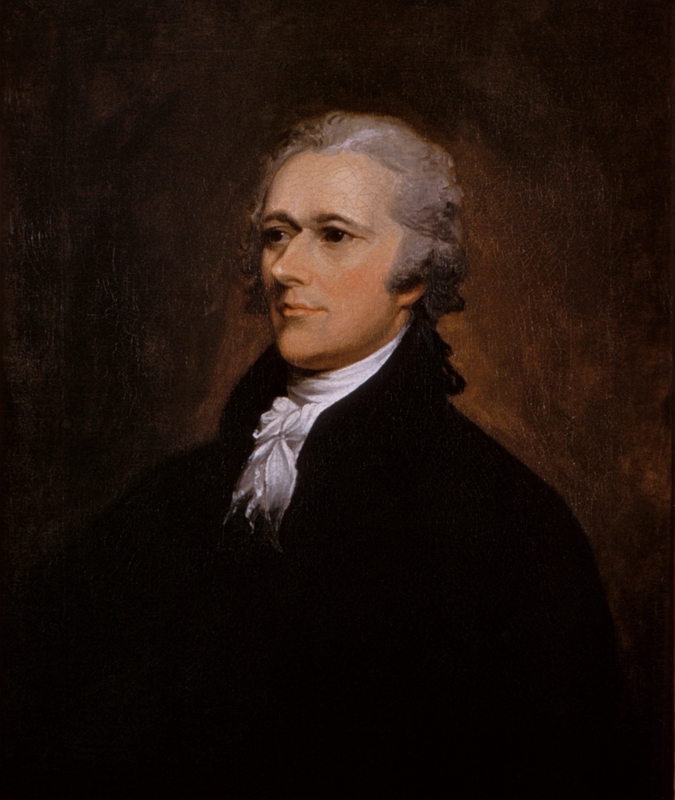 He understood why Andrew fought so hard to end the Second Bank of the United States. So Kennedy wrote and signed Executive Order 11110 which ordered the US Treasury to issue a new public currency, the United States Note. 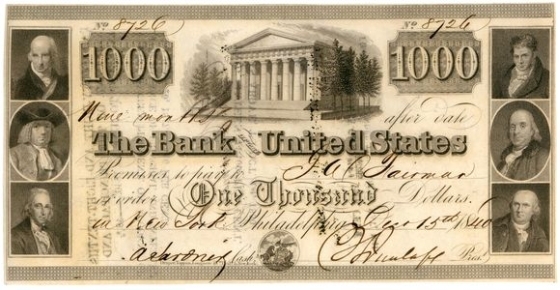 Kennedy’s United States Note – Click for largerKennedy’s United States Notes were not borrowed from the Federal Reserve but created by the US Government and backed by the silver stockpiles held by the US Government. It represented a return to the system of economics the United States had been founded on, and was perfectly legal for Kennedy to do. All told, some four and one half billion dollars went into public circulation, eroding interest payments to the Federal Reserve and loosening their control over the nation. Five months later John F. Kennedy was assassinated in Dallas Texas, and the United States Notes pulled from circulation and destroyed (except for samples held by collectors). 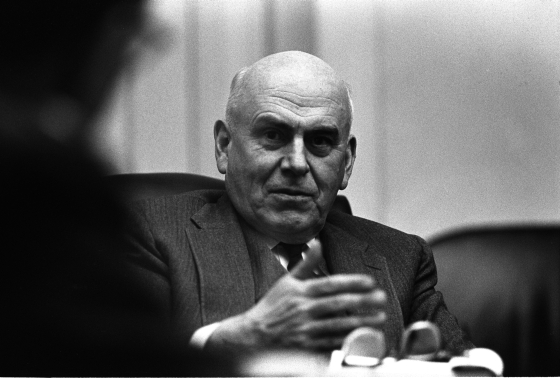 John J. McCloy, President of the Chase Manhattan Bank, and President of the World Bank, was named to the Warren Commission, presumably to make certain the banking dimensions behind the assassination were concealed from the public. As we enter the eleventh year of what future history will most certainly describe as World War Three, we need to examine the financial dimensions behind the wars. Towards the end of World War Two, when it became obvious that the allies were going to win and dictate the post war environment, the major world economic powers met at Bretton Woods, a luxury resort in New Hampshire in July of 1944, and hammered out the Bretton Woods agreement for international finance. The British Pound lost its position as the global trade and reserve currency to the US dollar (part of the price demanded by Roosevelt in exchange for the US entry into the war). 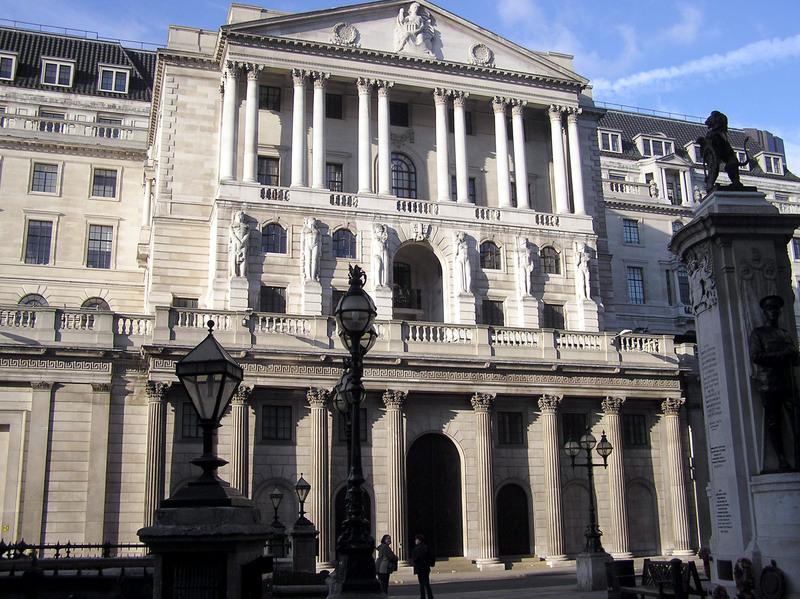 Absent the economic advantages of being the world’s “go-to” currency, Britain was forced to nationalize the Bank of England in 1946. The Bretton Woods agreement, ratified in 1945, in addition to making the dollar the global reserve and trade currency, obligated the signatory nations to tie their currencies to the dollar. The nations that ratified Bretton Woods did so on two conditions. The first was that the Federal Reserve would refrain from over-printing the dollar as a means to loot real products and produce from other nations in exchange for ink and paper; basically an imperial tax. That assurance was backed up by the second requirement, which was that the US dollar would always be convertible to gold at $35 per ounce. The Federal Reserve, being a private bank and not answerable to the US Government, did start overprinting paper dollars, and much of the perceived prosperity of the 1950s and 1960s was the result of foreign nations’ obligations to accept the paper notes as being worth gold at the rate of $35 an ounce. Then in 1970, France looked at the huge pile of paper notes sitting in their vaults, for which real French products like wine and cheese had been traded, and notified the United States government that they would exercise their option under Bretton Woods to return the paper notes for gold at the $35 per ounce exchange rate. 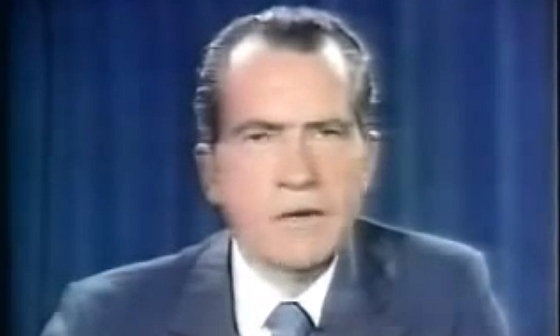 The United States had nowhere near the gold to redeem the paper notes, so on August 15th, 1971, Richard Nixon “temporarily” suspended the gold convertibility of the US Federal Reserve Notes. 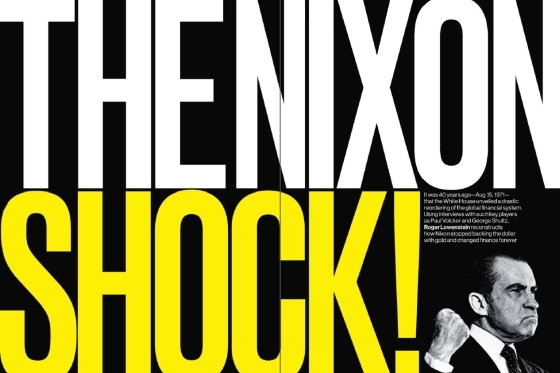 Nixon announces the end of gold convertabilityLater termed the “Nixon shock”, this move effectively ended Bretton Woods and many global currencies started to delink from the US dollar. Worse, since the United States had collateralized their loans with the nation’s gold reserves, it quickly became apparent that the US Government did not in fact have enough gold to cover the outstanding debts. Foreign nations began to get very nervous about their loans to the US and understandably were reluctant to loan any additional money to the United States without some form of collateral. 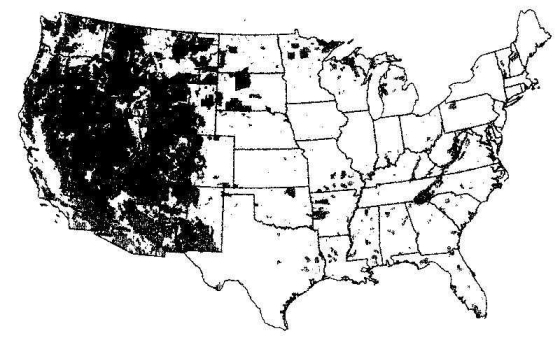 So Richard Nixon started the environmental movement, with the EPA and its various programs such as “wilderness zones”, Roadless areas”, Heritage rivers”, “Wetlands”, all of which took vast areas of public lands and made them off limits to the American people who were technically the owners of those lands. But Nixon had little concern for the environment and the real purpose of this land grab under the guise of the environment was to pledge those pristine lands and their vast mineral resources as collateral on the national debt. The plethora of different programs was simply to conceal the true scale of how much American land was being pledged to foreign lenders as collateral on the government’s debts; eventually almost 25% of the nation itself. All of this is illegal as the Enclave Clause of the Constitution limits the Federal Government to owning the land under Federal Government buildings and military bases, and that Enclave Clause was written into the Constitution by the Founding Fathers to specifically to prevent the Federal Government simply seizing the land beloning to the people to sell off, pledge as collateral, or rent! With open lands for collateral already in short supply, the US Government embarked on a new program to shore up sagging international demand for the dollar. The United States approached the world’s oil producing nations, mostly in the Middle East, and offered them a deal. In exchange for only selling their oil for dollars, the United States would guarantee the military safety of those oil-rich nations. The oil rich nations would agree to spend and invest their US paper dollars inside the United States, in particular in US Treasury Bonds, redeemable through future generations of US taxpayers. The concept was labeled the “petrodollar”. In effect, the US, no longer able to back the dollar with gold, was now backing it with oil. Other peoples’ oil. And that necessity to keep control over those oil nations to prop up the dollar has shaped America’s foreign policy in the region ever since. But as America’s manufacturing and agriculture has declined, the oil producing nations faced a dilemma. Those piles of US Federal Reserve notes were not able to purchase much from the United States because the United States had little (other than real estate) anyone wanted to buy. Europe’s cars and aircraft were superior and less costly, while experiments with GMO food crops led to nations refusing to buy US food exports. Israel’s constant belligerence against its neighbors caused them to wonder if the US could actually keep their end of the petrodollar arrangement. Oil producing nations started to talk of selling their oil for whatever currency the purchasers chose to use. 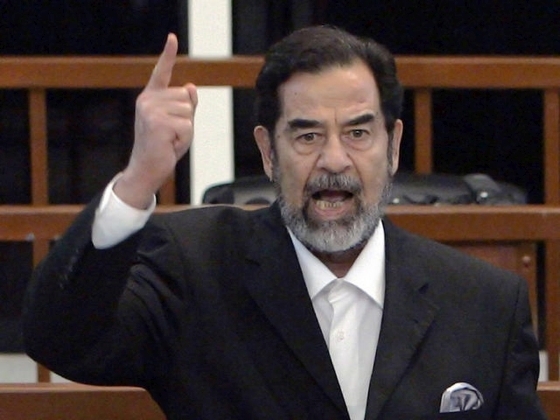 Saddam HusseinIraq, already hostile to the United States following Desert Storm, demanded the right to sell their oil for Euros in 2000 and in 2002, the United Nations agreed to allow it under the “Oil for food” program instituted following Desert Storm. One year later the United States re-invaded Iraq under the lie of Saddam’s nuclear weapons, lynched Saddam Hussein, and placed Iraq’s oil back on the world market only for US dollars. The clear US policy shift following 9-11, away from being an impartial broker of peace in the Mideast to one of unquestioned support for Israel’s aggressions only further eroded confidence in the Petrodollar deal and even more oil producing nations started openly talking of oil trade for other global currencies. GaddafiOver in Libya, Muammar Gaddafi had instituted a state-owned central bank and a value based trade currency, the Gold Dinar. 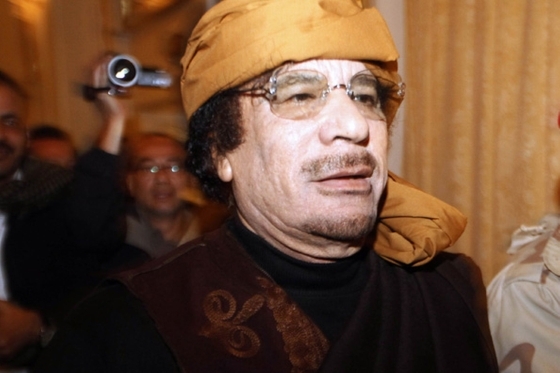 The Gold DinarGaddafi announced that Libya’s oil was for sale, but only for the Gold Dinar. Other African nations, seeing the rise of the Gold Dinar and the Euro, even as the US dollar continued its inflation-driven decline, flocked to the new Libyan currency for trade. This move had the potential to seriously undermine the global hegemony of the dollar. French President Nicolas Sarkozy reportedly went so far as to call Libya a “threat” to the financial security of the world. So, the United States invaded Libya, brutally murdered Qaddafi ( the object lesson of Saddam’s lynching not being enough of a message, apparently), imposed a private central bank, and returned Libya’s oil output to dollars only. 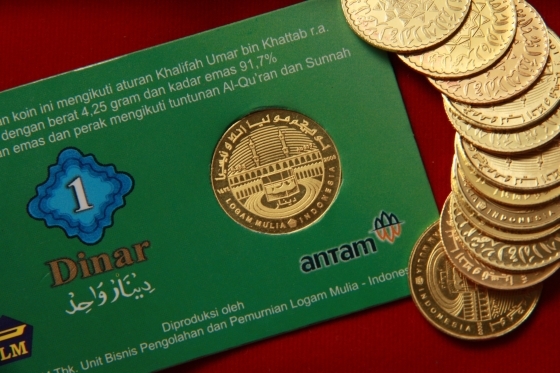 The gold that was to have been made into the Gold Dinars is, as of last report, unaccounted for. 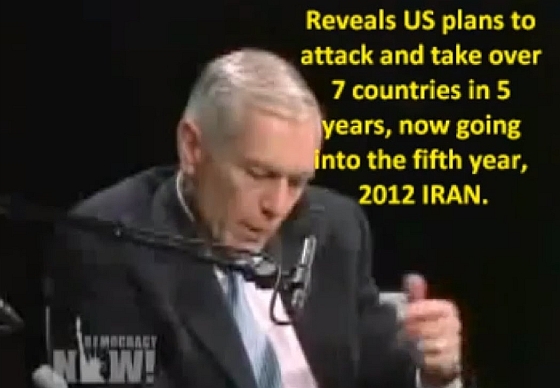 General Wesley Clark blows the whistle on US plans to conquer the oil-rich Middle EastAccording to General Wesley Clark, the master plan for the “dollarification” of the world’s oil nations included seven targets, Iraq, Syria, Lebanon, Libya, Somalia, Sudan, and Iran (Venezuela, which dared to sell their oil to China for the Yuan, is a late addition). 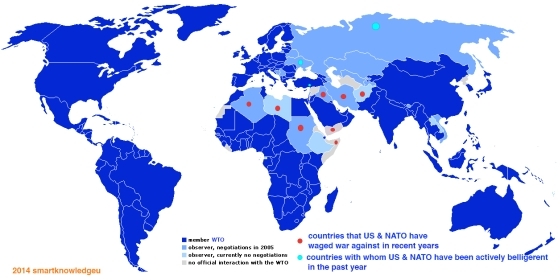 What is notable about the original seven nations originally targeted by the US is that none of them are members of the Bank for International Settlements, the private central bankers private central bank, located in Switzerland. This meant that these nations were deciding for themselves how to run their nations’ economies, rather than submit to the international private banks. Now the bankers’ gun sights are on Iran, which dares to have a government central bank and sell their oil for whatever currency they choose. The war agenda is, as always, to force Iran’s oil to be sold only for dollars and to force them to accept a privately owned central bank. Malaysia, one of the few remaining nations without a Rothschild central bank, is now being invaded by a force claimed to be “Al Qaeda” and has suffered numerous suspicioous losses of its commercial passenger jets. With the death of President Hugo Chavez, plans to impose a US and banker friendly regime on Venezuela are clearly being implemented. Germany’s gold bullion. Where is it?The German government recently asked for the return of some of their gold bullion from the Bank of France and the New York Federal Reserve. France has said it will take 5 years to return Germany’s gold. 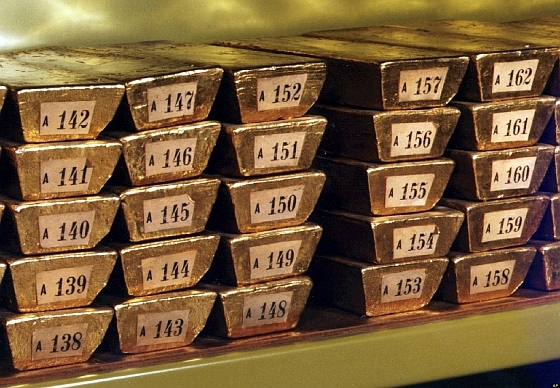 The United States has said they will need 8 years to return Germany’s gold. This suggests strongly that the Bank of France and the NY Federal Reserve have used the deposited gold for other purposes, most likely to cover gold futures contracts used to artificially suppress the price of gold to keep investors in the equities markets, and the Central Banks are scrambling to find new gold to cover the shortfall and prevent a gold run. So it is inevitable that suddenly France invades Mali, ostensibly to combat Al Qaeda, with the US joining in. Mali just happens to be one of the world’s largest gold producers with gold accounting for 80% of Mali exports. War for the bankers does not get more obvious than that! Mexico has demanded a physical audit of their gold bullion stored at the Bank of England, and along with Venezuela’s vast oil reserves (larger than Saudi Arabia), Venezuela’s gold mines are a prize lusted after by all the Central Banks that played fast and loose with other peoples’ gold bullion. So we can expect regime change if not outright invasion soon. You have been raised by a public school system and media that constantly assures you that the reasons for all these wars and assassinations are many and varied. The US claims to bring democracy to the conquered lands (they haven’t; the usual result of a US overthrow is the imposition of a dictatorship, such as the 1953 CIA overthrow of Iran’s democratically elected government of Mohammad Mosaddegh and the imposition of the Shah, or the 1973 CIA overthrow of Chile’s democratically elected government of President Salvador Allende, and the imposition of Augusto Pinochet), or to save a people from a cruel oppressor, revenge for 9-11, or that tired worn-out catch all excuse for invasion, weapons of mass destruction. Assassinations are always passed off as “crazed lone nuts” to obscure the real agenda. The real agenda is simple. It is enslavement of the people by creation of a false sense of obligation. 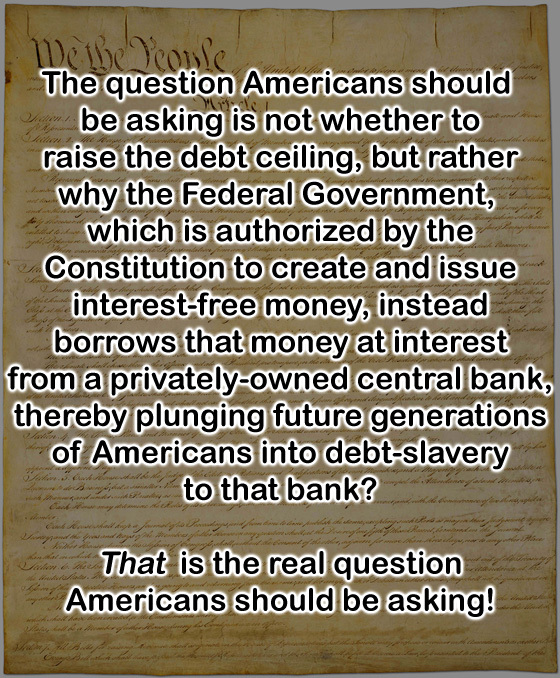 That obligation is false because the Private Central Banking system, by design, always creates more debt than money with which to pay that debt. Private Central Banking is not science, it is a religion; a set of arbitrary rules created to benefit the priesthood, meaning the owners of the Private Central Bank. The fraud persists, with often lethal results, because the people are tricked into believing that this is the way life is suppoed to be and no alternative exists or should be dreamt of. The same was true of two earlier systems of enslavement, Rule by Divine Right and Slavery, both systems built to trick people into obedience, and both now recognized by modern civilizatyion as illegitimate. Now we are entering a time in human history where we will recognize that rule by debt, or rule by Private Central Bankers issuing the public currency as a loan at interest, is equally illegitimate. It only works as long as people allow themselves to believe that this is the way life is supposed to be. But understand this above all; Private Central Banks do not exist to serve the people, the community, or the nation. Private Central Banks exist to serve their owners, to make them rich beyond the dreams of Midas and all for the cost of ink, paper, and the right bribe to the right official. Behind all these wars, all these assassinations, the hundred million horrible deaths from all the wars lies a single policy of dictatorship. The private central bankers allow rulers to rule only on the condition that the people of a nation be enslaved to the private central banks. Failing that, said ruler will be killed, and their nation invaded by those other nations enslaved to private central banks. The so-called “clash of civilizations” we read about on the corporate media is really a war between banking systems, with the private central bankers forcing themselves onto the rest of the world, no matter how many millions must die for it. Indeed the constant hatemongering against Muslims lies in a simple fact. Like the ancient Christians (prior to the Knights Templars private banking system) , Muslims forbid usury, or the lending of money at interest. And that is the reason our government and media insist they must be killed or converted. They refuse to submit to currencies issued at interest. They refuse to be debt slaves. So off to war your children must go, to spill their blood for the money-junkies’ gold. We barely survived the last two world wars. In the nuclear/bioweapon age, are the private central bankers willing to risk incinerating the whole planet just to feed their greed? 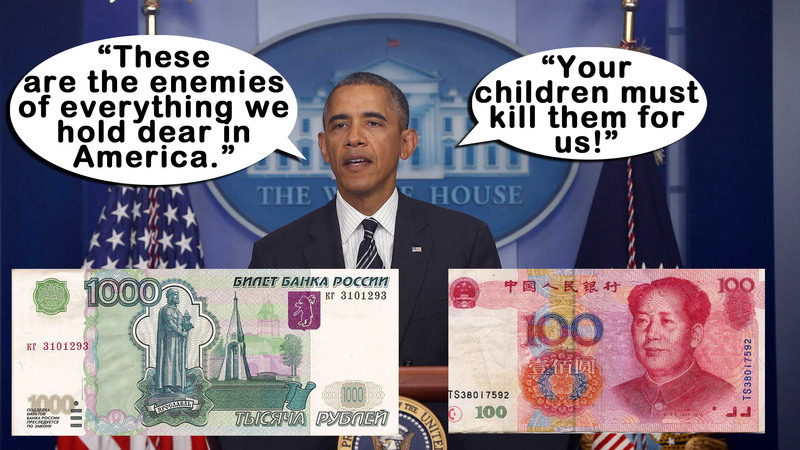 This brings us to the current situation in the Ukraine, Russia, and China. The European Union had been courting the government of the Ukraine to merge with the EU, and more to the point, entangle their economy with the private-owned European Central Bank. The government of the Ukraine was considering the move, but had made no commitments. Part of their concern lay with the conditions in other EU nations enslaved to the ECB, notably Cyprus, Greece, Spain, and Italy. So they were properly cautious. Then Russia stepped in with a better deal and the Ukraine, exercising the basic choice all consumers have to choose the best product at the best price, dropped the EU and announced they were going to go with Russia’s offer. It was at that point that agents provocateurs flooded into the Ukraine, covertly funded by intelligence agency fronts like CANVAS and USAID, stirring up trouble, while the western media proclaimed this was a popular revolution. Snipers shot at people and this violence was blamed on then-President Yanukovich. However a leaked recording of a phone call between the EU’s Catherine Ashton and Estonia’s Foreign Minister Urmas Paet confirmed the snipers were working for the overthrow plotters, not the Ukrainian government. Urmas Paet has confirmed the authenticity of that phone call. This is a classic pattern of covert overthrow we have seen many times before. Since the end of WW2, the US has covertly tried to overthrow the governments of 56 nations, succeeding 25 times. Examples include the 1953 overthrow of Iran’s elected government of Mohammed Mossadegh and the imposition of the Shah, the 1973 overthrow of Chile’s elected government of Salvador Allende and the imposition of the Pinochet dictatorship, and of course, the current overthrow of Ukraine’s elected government of Yanukovich and the imposition of the current unelected government, which is already gutting the Ukraine’s wealth to hand to the western bankers. Brazil, Russia, India, China, and South Africa have formed a parallel financial system called BRICS, scheduled to officially launch on January 1, 2015. As of this writing some 80 nations are ready to trade with BRICS in transactions that do not involve the US dollar. Despite US economic warfare against both Russia and China, the Ruble and Yuan are seen as more attractive for international trade and banking than the US dollar, hence the US attempt to fan the Ukraine crisis into war with Russia, and attempts to provoke North Korea as a back door to war with China. Flag waving and propaganda aside, all modern wars are wars by and for the private bankers, fought and bled for by third parties unaware of the true reason they are expected to gracefully be killed and croppled for. The process is quite simple. As soon as the Private Central Bank issues its currency as a loan at interest, the public is forced deeper and deeper into debt. 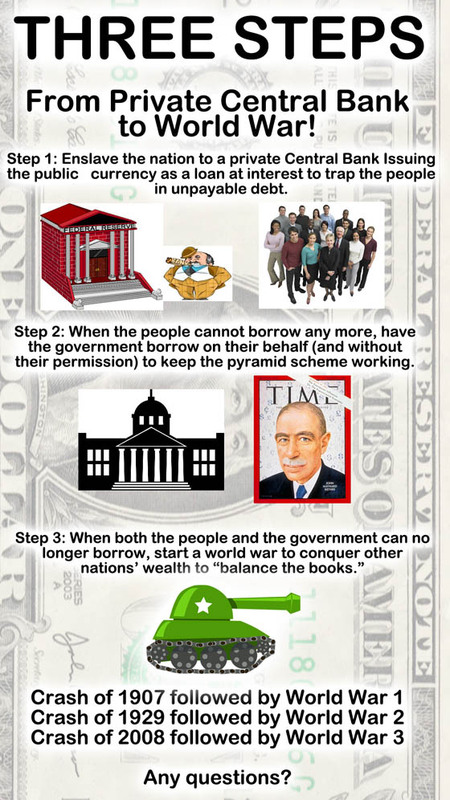 When the people are reluctant to borrow any more, that is when the Keynesian economists demand the government borrow more to keep the pyramid scheme working. When both the people and government refuse to borrow any more, that is when wars are started, to plunge everyone even deeper into debt to pay for the war, then after the war to borrow more to rebuild. When the war is over, the people have about the same as they did before the war, except the graveyards are far larger and everyone is in debt to the private bankers for the next century. This is why Brown Brothers Harriman in New York was funding the rise of Adolf Hitler. As long as Private Central Banks are allowed to exist, inevitably as the night follows day there will be poverty, hopelessness, and millions of deaths in endless World Wars, until the Earth itself is sacrificed in flames to Mammon. The path to true peace on Earth lies in the abolishment of all private central banking everywhere, and a return to the state-issued value-based currencies that allow nations and people to become prosperous. Gray State – The Rise (Rough Cut) Released After Writer/ Director Found Murdered. A third film called Money as Debt III - Evolution Beyond Money, released in 2011, presents Grignon's ideas on the possible forms money may take in the future. Copyright 2019 © SheepleTV.com All rights reserved. All content posted is commentary or opinion and is protected under Free Speech & meets the legal requirements for fair use or fair dealing under applicable copyright laws. SheepleTV.com is not responsible for content written by it's contributing authors. The information is provided for educational purposes only. It is not intended as a substitute for professional advice of any kind. SheepleTV.com assumes no responsibility for the use or misuse of this material. Please note that by playing this or any other Video Clip Online the NSA/Google/YouTube/Gestapo/Thought Police are placing a long-term cookie (digital footprint) & tracking (device) on your computer/ Network connection/ MAC address to track your viewing habits, search terms, Threat Matrix Score etc. Time to choose. Sleep Well Sheeple Slaves or Wake The Flock UP!